I worked in the new garden area this morning. I watered the long flower bed and spread the seeds. I put the compost/potting soil over the seeds and watered it again. I fed the trees and watered them. DR put the inside fence up and put wire around the trees. 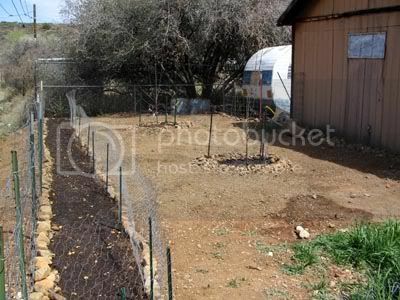 Then I moved rocks along the fence and around the trees. Good work Dooley. Looks well protected. What seeds did you plant again? Sorry to hear about the cats!! Did you get your netting up yet? The seeds you planted should be gorgeous before long. What a great combination choice! !